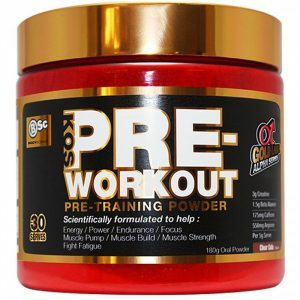 A strong and effective pre-workout with pump and focus. L-Tyrosine helps to activate metabolic pathways that produce the hormones epinephrine and norepinephrine – which are typically produced during moments of stress on the body and provide a boost in the terms of a “fight or flight” scenario. Epinephrine and norepinephrine are depleted quickly during these moments of stress due to a lack of L-Tyronsine. 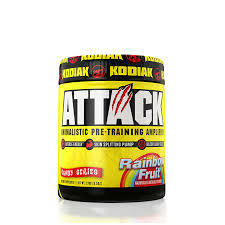 The addition of this amino acid to Attack will help give you an extra PUSH and can make a big difference to help you FIGHT through your workouts and plateaus. Hoffman et al. (2010) research results indicate that acute ingestion of supplement including L-tyrosine and anhydrous caffeine, can maintain reaction time, and subjective feelings of focus and alertness to both visual and auditory stimuli in healthy college students following exhaustive exercise. 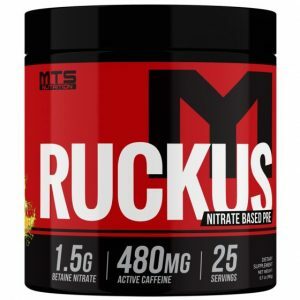 This blend of caffeine helps to provide effectively dosed stimulation for your training and not keep you up all night long. 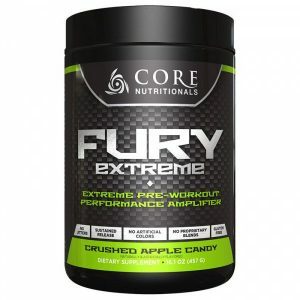 It is also formulated to help fight that horrible crash you might experience with stimulated laden pre-workouts. Multiple studies have confirmed can improve muscular endurance and power, focus and cognitive performance, and improve energy levels. Caffeine has also been shown to have a thermogenic effect (heating/calorie burning) at rest and may increase the use of fats for fuel during exercise. Doherty and Smith performed a meta-analysis of caffeine’s effects on perceived exertion and found a 5.6% decrease in RPE (rating of perceived exhertion) during exercise. This means exercise may feel easier at higher effort levels when supplementing with caffeine. Cytidine 5’-diphosphocholine is a nootropic compound that converts to both choline and cytidine upon ingestion. It helps to increase memory and cognitive function. Studies have shown that it can also help increase attention. McGlade et al. (2012) discovered women who supplemented with Cytidine 5’-diphosphocholine for 28 days were able to significantly improve attention focus and attention inhibition compared to placebo. Huperizine A is a selective inhibitor of the neurotransmitter acetylcholinesterase (AChE), which means it prevents the breakdown and increases the amount of acetylcholine; an important neurotransmitter in the central nervous system involved in cognition and muscular contractions. Multiple studies have shown that supplementation with Huperzine-A can enhance focus, memory and mood. A study conducted by Sun et al. (1999) reported that subjects who supplemented with Huperzine A for 4 weeks improved learning performance and memory compared to a placebo group. 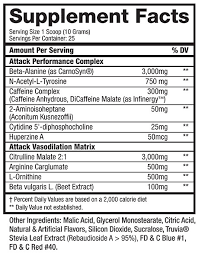 Citrulline Malate is a non-essential amino acid that eventually converts to nitric oxide. Nitric oxide is a vasodilator that can help to lower blood pressure and improve blood flow to both organs and muscles. Studies have shown that Citrulline Malate enhances exercise tolerance by reducing levels of blood ammonia and lactate that are typically elevated during strenuous exercise. This ingredient will allow you to train with less rest in between sets and elevate your endurance capacity. 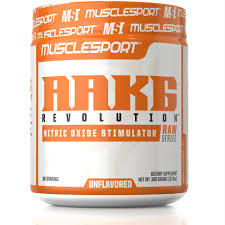 A recent research study found individuals who consumed citrulline malate for 15 days were able to increase ATP production during exercise by 34% and improve phospho-creatine resynthesis after exercise by 20%. Arginine is a semi-essential amino acid and is a chemical precursor to nitric oxide (a blood vessel-widening agent). When Arginine enters the body it stimulates nitric oxide pathways. This process vasodilates (enlarges) blood vessels and helps deliver more of the much needed oxygen rich blood and nutrients to working muscles in order to achieve the pump and ultimately muscle growth. Arginine also triggers the body to make protein and has been studied for healing wounds, bodybuilding, and preventing tissue degradation in people with critical illnesses. A 2010 study conducted by Bailey et al. discovered supplemental arginine for 3 days was able to enhance nitric oxide production and decrease oxygen consumption (7%) while improving time to exhaustion by 25% in otherwise healthy men. Ornithine when bound by salt at the molecular level to Orotate (orotic acid) is much more bio-available than in its HCL or free form. Ornithine Works in synergy with Arginine in the metabolism of waste caused by intense exercise. By increasing Nitric Oxide production and decreasing waste – you are able to train longer and support greater results. A 2008 study conducted by Sugino et al. discovered supplementation with ornithine was able to reduce perceptions of fatigue to 52% of placebo on a prolonged endurance test and was able to reduce ammonia accrual during exercise. When do I take It? Take Your pre trainer 30minutes-1hr before hitting the gym. You should feel the stimulant effects of Attack within the first 15-30minutes post consumption. Results may vary.